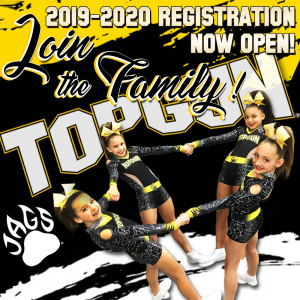 Registration for the 2019-2020 Top Gun Season is OFFICIALLY OPEN! We’re glad you’re here! Here’s what we recommend if you’re interested in joining the Top Gun Family! First and foremost: CREATE A NEW ACCOUNT HERE! This is the first and MOST IMPORTANT step! Stop into the gym and pick up an information packet/registration form, read it over throughly and ASK QUESTIONS! Parents can review the packet while the athlete tries out one of our tumbling classes! We know we have some friends that may have a commute of an hour or more, and coming to the gym may not be the easiest option! If this is your family, please call the front desk at 440.937.5591 and they will assist you. Turn in your completed registration form by April 5th and receive a $100 credit!